There are things you've got to respect in the world of comics and there are things you don't. Headlining the 'Do' column is a title or creative team that sidesteps tying into a big event, to keep it's own trajectory intact. That my friends is the crew of Marvel's Uncanny X-Force. While Avengers vs X-Men rages, the title that had the comic world on edge with the Dark Angel Saga, dives straight into Final Execution with May's #25 and cover art from Jerome Opena. In it, the nine issue mega arc, introduces a brand-new Brotherhood of Evil Mutants and The Omega Clan, folks built from the remains of cyber-nasty Omega Red. 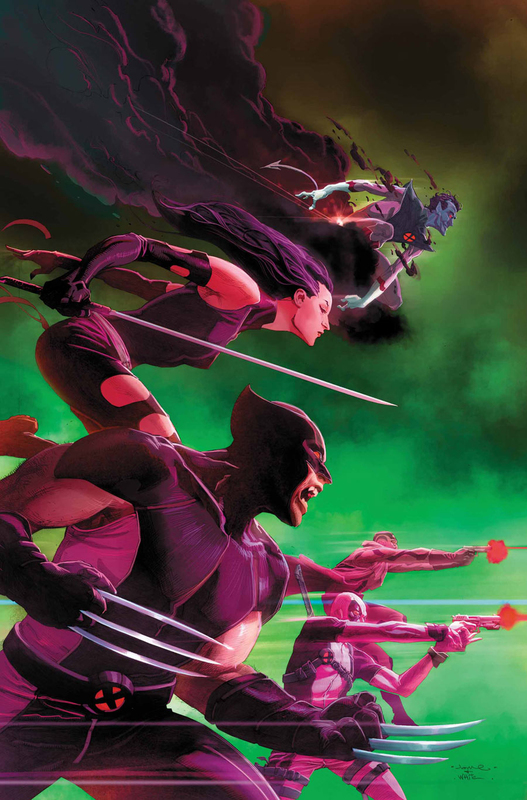 Written by Rick Remender, with interior artists including Mike McKone, Final Execution promises to have a key impact on both Psylocke and Wolverine. The Force, cross the Clan's store 'White Sky', where you can shop for the type of assassin you want - and you know how Wolverine responds to people turning people into weapons! Focusing on storylines that actually have a personal stake for the team, Remender is out to remind fans part of Wolverine's appeal is the inner struggle he goes through against popping his claws - until there is no other option. Now that's a fact that should earn him a beer. Remender also pointed out on Marvel.com's liveblog session, the reason he went for fighting the toughest version of the Brotherhood yet over Cap and his crew, was because "there was no story". Maybe not, but bet your bottom dollar, Final Execution will be. To read the Uncanny X-Force liveblog interview in full, click here. i'm totally digging this rendering of the X-Men. i like the action posses and the way it's over all composed. i also really like what they did with the colors. by the way Dan thanks for the flattering comment on the covered blog. i actually just came up with a brilliant idea for your Optimus Prime notepad drawing for the re-cornered blog. check your email when you finally wake up today. as of the writing of this comment i estimate it's around 5 A.M. down under. If there's one thing X-Force has never dipped out on Dave - it's great covers, and you're right this one is floating at the top of that mix. Heck I still have the return of Archangel based cover it ran in it's earlier days as my wallpaper. But that's because I'm nuts for that character!